c) hearty and comforting, so that they just hit the spot at the end of a long weary day. A great advantage for a home cook is to have a few easy dinner recipes down pat. Those that you can throw together almost mechanically, without having to consult a recipe or having to rummage through the kitchen for a long list of ingredients. It certainly helps if the dish gets ready in less time than it would take for a bag of greasy take-out to arrive at your door. One such recipe is "khichdi". 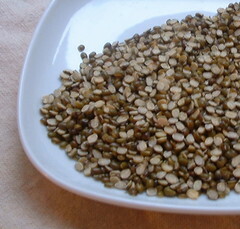 A blend of rice and lentils cooked together, it offers both carbs and protein in one nutritious package. Since khichdi is one of those inexact dishes where you can dump in almost anything you can think off, the word "khichdi" in Hindi also colloquially means "chaos". I love the way this lentil cooks with the rice resulting in the perfect consistency. NYC has been so rainy, damp, chilly and miserable in the past few days: this khichdi got made several times, I can tell ya! 1. Heat oil, then temper with the cumin and mustard seeds. 2. Add onion, garlic, curry leaves and saute for a minute. 3. Add turmeric, red chilli powder, coriander powder and salt and stir for a few seconds. 4. Add the rice, dal and 3 cups water. 5. Bring to a boil, then simmer until everything cooks together as a mushy, delicious mix. 1. This recipe is best done in a pressure cooker, but can certainly also work on the stove-top in a covered pot. 2. If you have veggies on hand, saute a cup of diced veggies (peas, zucchini, cauliflower, carrot work well) between step 2 and 3, and add another 1/2 cup of water in step 4. 3. A great variation is "gili" or wet khichdi, in which you would add another cup of water at step 4, resulting in a slurpy, soupy consistency. 4. Serve with a dollop of ghee and some pickle on the side, if desired. I served this last night with some sauteed red cabbage-and-peas. I'll see you again in 3-4 days (promise!). Thanks for being patient! Khichdi on a rainy day ? Sounds perfect. Simple and delicious recipe. 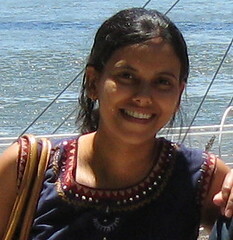 hi nupur, nice to have you back . we really missed you. grt khichdi.......true comfort food. see you in 3,4 days.luv, yoma. Welcome back! This sounds like it would be similar to a mediterannean dish I love called Mujadarah. 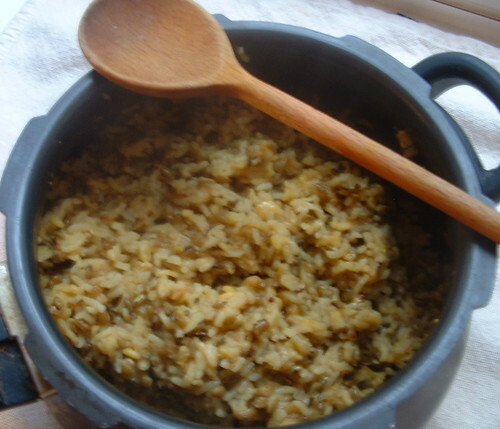 It's lentil, rice, and carmelized onions. I'm very interested to see what kind of seasonings you use because I haven't been able to make Mujadarah successfully at home, so I will have to try this as a substitute! Is kichadi a generic name for all rice preparations like this? Nabeela, I just want to clarify that the reason I am so busy is simply because of my heavy work-load (I am trying to wrap up my PhD). Hi Nupur- I have been checking regularly and I am so happy to see a new post from you. Hi yoma, thanks for stopping by! Kalyn, Mujadarah has been on my "to-make" list for ages!!! Thanks for reminding me of this dish...I need to try it soon. LG, yes, khichdi is a common name for rice-lentil mixed preparations, but you can also have other types of khichdi like "sabudana khichdi" (sago). is that whole moong beans or split moong with skin? Heyyy...!! So NICE to see you back with a new post, Nupur! :) How's married life treating ya? Welcome back,and thank you for this recipe. I have never made khichadi with moongdal before. one always knows when you are alive. but one has started to check your blog to see that you are alive *and* well! one always knows when you are alive. but one has started checking your blog to know that you are alive *and* well. Hi Nupur,Such a relief to see you back again with recipes! Hey All the very Best for the PhD!Dont get stressed out,you can post recipes at your leisure,we can wait fot you patiently till then! We made Khichdi for dinner today and followed your recipe to the tee. It was great! I also made kadhi, also your recipe - http://onehotstove.blogspot.com/2005/03/khichdi-kadhi-indias-comfort-food.html. They are both keepers. Iam anu. 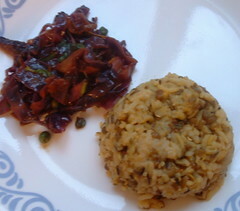 Thnks for ur receipe (Dal kichdi).Its very nice. Ur recipe indeed looks yummy. Am new to this site and got it when i was searching for khichdi receipes other than with rice, i have a vague idea of khichdi with white maize (heard it?? )-somewhere i ate and wished to try it out but no recepie-any ideas??? Also ur khichdi has red moon?? (the picture shows) i know only two moon-green and yellow. The picture actually shows green unhulled moong dal. If it looks red on your computer, it could be because your browser/ screen is giving it a red tint (which can happen with these digital pictures). I too know of only green and yellow moong dal, red is usually masoor dal. Any other questions, please don't hesitate to ask! I made this today! Thanks for such a simple recipe.. especially with easy to use ingredients!!!!!! I dont eat Onion/Garlic (Jain)..so i replaced them with Hing.. worked just right! can you mix split green and yellow moong? I have the green but not that much and also found yellow in the cupboard so wondered if I could add that?